This casual sectional sofa will be perfect in your living room. 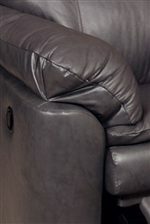 The sofa can be configured to fit your room and your needs, with different components featuring luxuriously plush high backs on recliners and chaises, with large pillow top arms. The piece has a unique locking system to keep components together. These sectional components are available in different leathers by special order, so the sofa will surely match your home decor. The Lackawanna Sectional Sofa by England at Jordan's Home Furnishings in the New Minas, Halifax, and Canning, Nova Scotia area. Product availability may vary. Contact us for the most current availability on this product. 730022L Wedge Seat 1 66" 40" 39"
730057L Right Arm Facing Reclining Chair 1 34" 40" 39"
730039L Armless Chair 2 24" 40" 39"
730058L Left Arm Facing Recling Chair 1 34" 40" 39"
Fabric Options Multiple leathers available by special order. Leg or Skirt No visible leg. Recliner Mechanism One touch release. Frame Construction Frame is made from ¾” or 7/8” furniture grade plywood. Precision cut, fully interlocked frame with guide notches for accurate assembly. Perpendicular joints notched for increased overall frame strength. Frames reinforced with hardwood on stress points. The Lackawanna collection is a group of stylish casual living room furniture and sectional components that can be configured to fit your home. The pieces feature extra plush high back cushion and box seat cushions, and large pillow top arms that complete the luxurious look. With over a dozen different sectional components, the configuration options are endless. 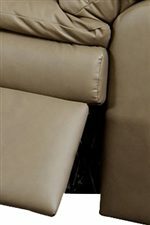 Options include chaises, recliners with easy release, and a sleeper component. 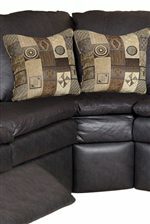 Choose your favorite components and your favorite leather to customize your living room style by special order. The Lackawanna collection is a great option if you are looking for Casual furniture in the New Minas, Halifax, and Canning, Nova Scotia area. Browse other items in the Lackawanna collection from Jordan's Home Furnishings in the New Minas, Halifax, and Canning, Nova Scotia area.